Thank you for your interest in MINTAGE products. 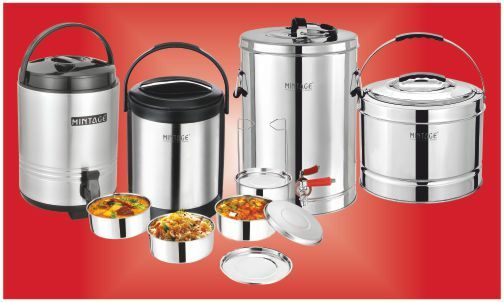 As you know, we are one of the fastest growing manufacturer of stainless steel kitchenware, thermoware, hotelware, all range of cookware of stainless steel, hard anodized and non stick, corporate gifts and all types of dustbins. MINTAGE quality story begins with the choosing highest raw materials and to combine with the best handcrafting & automation. Nowadays, technology and designs are the most vital aspects to manufacturing the most up to date, long-lasting, design-oriented and ergonomic products. In our desire to make the finest product, our designers & engineers examine every details of knowledge gained through the years, along with our passion for trademark excellence. Here, there is a genuine passion in everything we touch, the way we concentrate on the smallest details and our focus on handcrafted quality and solutions. This unbridled commitment to quality makes out products truly special.